Here’s some eye candy to look forward to! Native Plant Salvage Foundation is a non-profit, 501(c)(3) charitable organization with the goals of providing hands on education to protect and conserve water resources and habitat from the South Sound prairies to the shores of the Salish Sea. 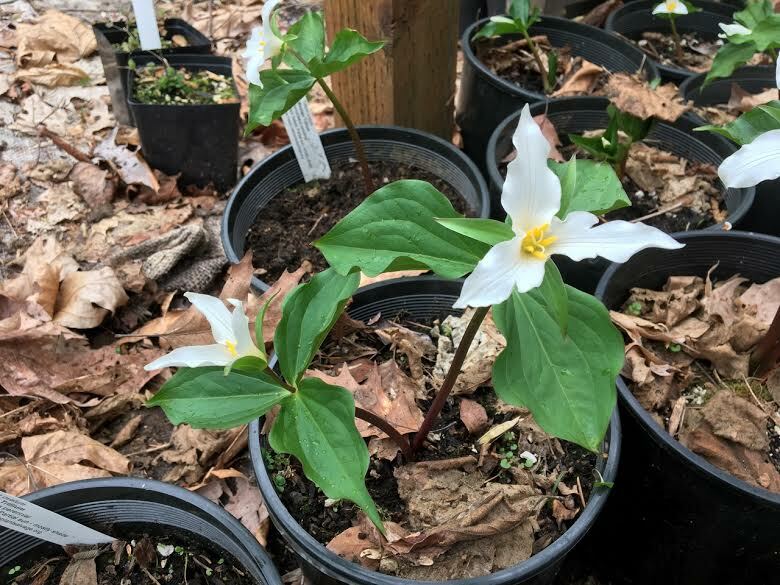 Support NPSF and our environment by making sustainable changes to your landscape and purchasing low-maintenance water-wise or native plants from our Spring Plant Sale. 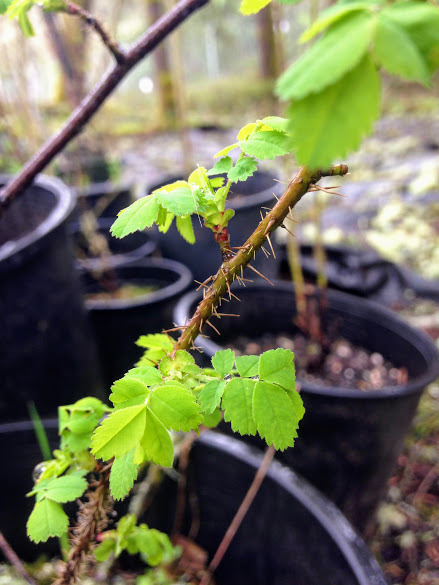 Pick up on Sunday, May 5th 11am-3pm at the NPSF Nursery in west Olympia, WA. Full to partial sun; 6' tall; carmine red flowers in spring; thrives in rocky, well drained soil in sunny locations and less well in heavy soils and shade; certainly one of the most beloved and showy PNW Native shrubs. Sun to part shade. One of our most prized native berries! Canes grow to about 6-ft tall over time; striking blue-white bark stands out in the part-shade landscape. 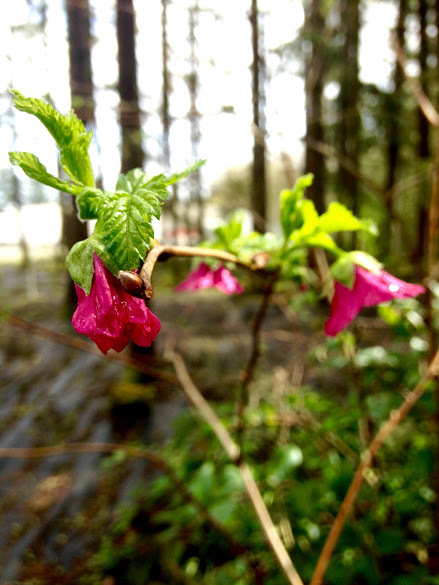 Part shade to full shade; 6-12'; PNW native with an early nectar source for rufous hummingbirds: magenta flowers, turning to edible salmonberries by midsummer. Sun to partial shade; shrub reaching 3m; armed at nodes; beautiful fuchsia-like flowers that group in 2 or 3; fruit is a sweet-tasting berry up to 1cm wide which is black when ripe. Part sun to partial shade. The most delicate and least aggressive of our PNW native roses. Small, lightly fragrant pink flowers in spring, followed by red-orange fruits lacking the "crown" (sepals). Tiny, needle-like prickles. Typically grows 4-6 feet tall. Partial to full sun; deciduous shrub or small tree that grows to 1–8 m. Growth form spans from suckering to clumped. The fruit is a small purple pome ripening in early summer. Sun to shade; 3-6'; PNW native great for many sites, revegetation, slope stability. Tiny pink flowers provide months of nectar to pollinators, showy white berries enhance the winter landscape! Partial shade to shade; up to 15' tall; This deciduous shrub does fine in poor soil conditions. First to bud its bright green leaves in the spring, this shrub develops dangling white clusters of flowers. As one of the first species to flower in the spring, it is an important plant for pollinators, and its late summer fruits are favored by many birds! 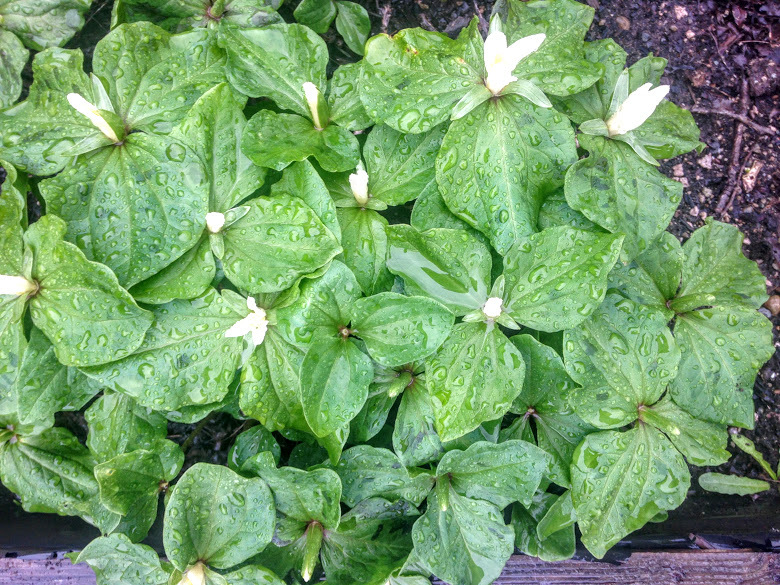 Part shade-shade; 3'-5' tall; likes humus rich soil, but tolerant of variety. Hardy king of NW native ferns! 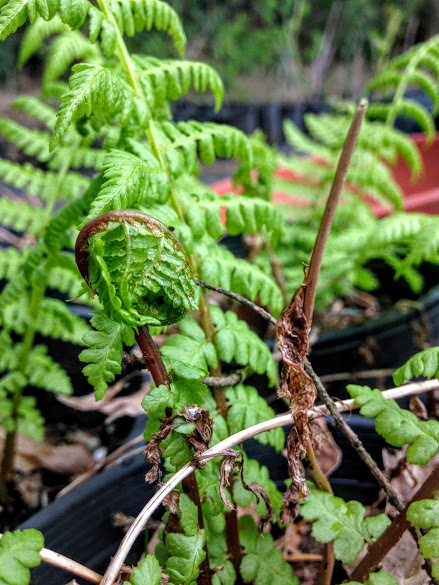 Feathery species of fern which grows well in shady, damp woodland environments, though it does tolerate dry situations better than most ferns; deciduous. Shade-loving perennial herb; spreads by underground rhizomes. Each plant has 1 or 2 flowering stalks, each up to 50 cm tall. Flowers are white or pink, the color sometimes becoming darker as they get older. Moist soil and shade dependent; perennial herb; spreads by underground rhizomes. Differs from more common T. ovatum by size and timing of flowers and modeled pattern on leaves. Sun loving (cannot live in shade) perennial in the carrot family; Native to prairies and other open often rocky places west of the Cascades. Full sun to part shade. Blooms of blue/purple star shaped flowers grace 2.5-4 stems from April to may. tolerant of dry clay soils. Full sun; silver-grey foliage with with lemon-yellow flower clusters that cover the plant all summer long; highly adaptable to water and soil needs. Great perennial border plant. Spring Plant Sale will open online soon. Supplies are limited, be ready with your wishlist when the sale opens! 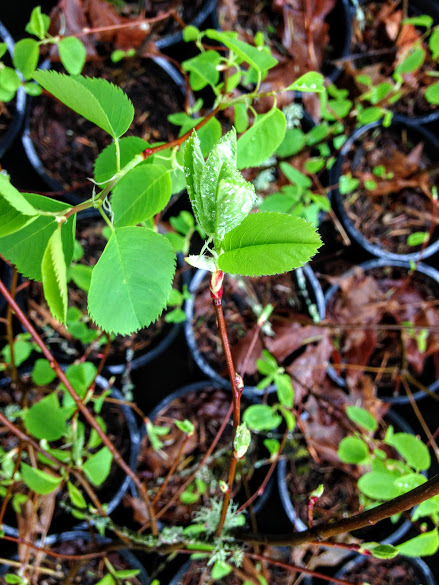 Sale will include a diversity of native prairie perennials, wetland and upland woody plants, berries and other edibles, plus water-wise cultivars. Get inspired this spring to transform your landscape into a pollinator haven, foraging paradise or water-wise wonderland! NPSF can supply the plants and some nifty ideas from our community of Green Thumbs. Keep up with our calendar and join us at a workshop or Plant ID Walk. The Spring Plant Sale is just the beginning to a great season of learning in the PNW.